Reprinted, with amiendmnents, \1' 1:. .
PRODUCTION AND MARKETING ADMINISTRATION . culture under the Agricultural Marketing Act of 1i'.14; (0i1 Stat. 1087: 7 U. S. C.
ment of Agriculture. The standards are relprint-d as amended. 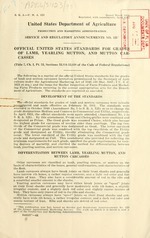 grade designations Medium and Common to Commercial and Utility, re-,0'r. ri' ,.Iy. lamb, yearling mutton, and mutton carcasses. a somewhat smaller amount in the shanks. lean. They have only traces of red in the ribs and shanks. coarse texture of lean. Ribs and shanks are devoid of red color. part of the Production and Marketing Administration. formation, and vice ver.i., are indicated for each grade. are very pl'i nt llt *i1. respectively, than those specified in the st; mnd; rds. tlii.-k, full, smooth shoulders; and short, thick necks. Evilhelii.-. of quality and finish vary markedly with clih;.,.-' in maturity. outside of legs. The flanks are very full and firm. inly be iqiii% ;iliit to ;,\'rag% Choice and remain eligible for Prime. slightly wide, full shoulders; and -li,1il1h short, thick necks. Evidences of quality and finish vary considerably with ,i.-lii.. in maturity. a very thin coverin:- of fat. Flank'; are -liulitly full and firm. legs are visible thcnti-li the fat. The flanks are moderately full and firm. conformation may be equivalent to average Good and remain .libil,'1i for Choice. narrow, thin backs and shoulders; and moderately 1'n-. thin necks. Evidences of quality and finish vary moderately with changes in maturity. fat. Flanks are moderately thin and soft. thin fat covering. Fliini,. are slightly thin and soft. high Utility and remain eligible for the Good grade. the (lif.r,.iti- are so small as to make their separate descriptions impractical. the lean in the inside flank muscles and between the ribs is dark red in color. high Cull and remain eligible for the Utility grade. fats, and the flesh is soft and watery and very dark red in color. tops of the sliililtr-, and outside of the legs. The flanks are very full and firm. interior fat are also included in the Choice grade. tion may be eqlii' aluit to average Good and remain eligible for Choice. only a very thin fat covering. Flanks are -lilIhtly thin and soft. to high Utility and remain eligible for the Good grade. to high Cull and remain eligible for the Utility grade. and the flesh is soft and watery and very dark red in color. through a thin covering of fat. Flanks are moderately full and firm. may be equivalent to average Good and remain eligible for Choice. are slightly thin and soft. also included in the Good grade. equivalent to high Utility and remain ,-lizill,. for the Good grade. are soft and -lightly watery. to hi -h Cull and remain eligible for the Utility grade.